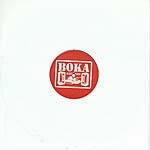 "Another 'buy on sight' release for the Boka Records camp. A fresh and long-awaited release from T. Langridge aka Tunnidge. 'Higher Forces' is an absolute foot stomper. Big kick drums, chirpy horns and a face-slapping snare. Guaranteed to tear up the dance! 'Riddles of Jah VIP.'...relentless. Speaker check on this. This is the way dubstep should be...effective, impactful and uncomplicated. Get this release now -- you'll be sorry if you sleep." -- Joe Nice. "Support for the releases comes from Mala, Distance, Cyrus, Marlow, Rob Sparx, Pinch and more."